Yesterday, I did a preso for my local Adobe User Group as part of the Norwegian Flash 10 year celebration. Before the session I made a small Keynote presentation that just cycled through screenshots from FutureSplash Animator/Flash 1 to Flash 8. I’m posting it here in case others need something similar and want to save the time installing all the trial versions. I found the first four over at Joen Amussen’s blog and added the last 4 myself (Download Keynote file here). The main preso highlighted the different versions, the related software and important events (as seen by me). This presentation was in Norwegian so it’s probably not that interesting for english speakers. I’ll use bits of it for an article on Flashmagazine.com at some point. 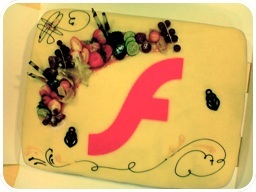 We had huge cake with the Flash logo on, so there was more than enough to eat for the twentysomething that showed up. Socially, this was one of the better NAUG meetings as more than half the crowd joined us for beers and chat afterwards at “Den Gamle Majors Lab”.